Remove the shells of eggs and cut it into 2 / 4 halves. Heat 1 or 2 tsp oil in a pan or kadhai and temper mustard seeds. Add sliced onions and curry leaves. Saute a while and add ginger-garlic paste. Saute a while and add tomatoes. Cook for two mins on low flame. Add boiled eggs and saute a while. Add turmeric powder, red chilli powder, 1 tsp pepper powder, cumin powder, garam masala and salt to taste. Mix everything well. Cook it covered for 5 mins. Since we have used less oil, the masala will become dry soon and start to stick to the bottom of pan. To avoid it you can add 1/4 cup water and stir well. Sprinkle 1 tsp pepper powder and cook it closed for 2-5 mins. 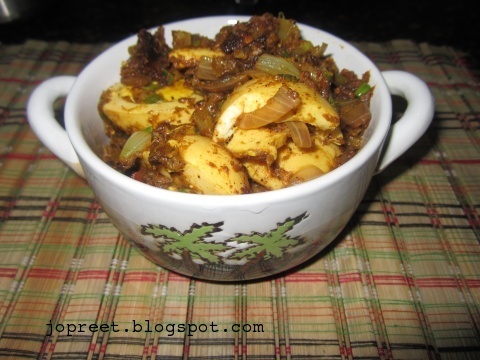 Remove from the heat and serve hot with roti or rice. You can also add little lemon juice if it is too spicy. You can avoid red chili powder and adjust the amount of pepper accordingly.